So, I really wanted an answer to the question in my recent post, Fast Handling vs. Natural Handling, so I asked Doug if he would ask Julian Bethwaite if he could answer it. Of course, he could, and he did! Julian Bethwaite is the son of Frank Bethwaite. In addition to working closely with his father, he is an extremely talented sailor, and an extremely talented designer. Pretty much all high performance dinghies can be traced back to one of Julian’s designs, in addition to the asymmetrical spinnaker, the upside down vang, and some trapeze thingy. I met him briefly, shook his hand, snapped a picture with him and was suitably impressed with how laid back and super cool he was. Then, we later saw him flying across Sydney Harbor testing out some new rigging on one of those numbered ‘er’ boats. I envy that man’s lifestyle. My Question: Frank's work with the simulator helped him see the difference in fast vs. natural handling. 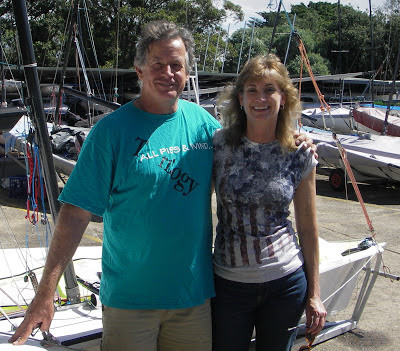 How do you take the fast handling know how on a dinghy and transfer it to fast handling on a bigger boat? 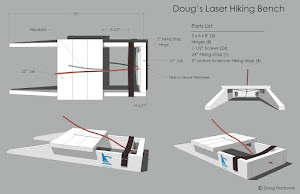 Specifically, how does a good dinghy sailor transfer fast handling knowledge to a bigger boat that far outweighs him and doesn't respond to his body movement, and, similarly, how do I apply it to a full rig Laser that outweighs me and doesn't respond to my body movement when the wind picks up? Julian’s Answer: Regarding the simulator, the fact you can have 1-2-3 people sailing the same course, under the same conditions and the same people do it consistently faster, and you also have print outs of their tiller movements, their sheet movements and their hiking responses or their preemptive moves, then with some deductive analysis that dad was so good at, the differences and the consistencies in those that do and those that do not, stand out and scream at you. 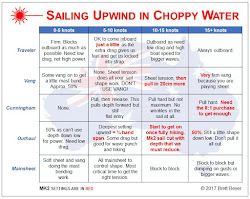 Then with a tad of taking a "natural" sailor and suggesting "fast" techniques and seeing if there was a corresponding increase in their simulator performance proves the point. As mentioned to get that to come across to on water performance had a few more hurdles to jump, but again, he got there. Regarding reaction to a boat that may weigh many times more than the crew, like a yacht, I find the biggest issue is being preemptive and also getting the boat in balance. If you know what to look for and again, sailing simulator will teach you that, but so will a good coach, then getting any boat in balance will make it go so much better, dare I say automatic. Regarding yachts, a few years back I sailed on a boat called Occasional Course Language or OCL for short, it was a Farr 40 but designed for ocean passages. Consistently we found the boat had lots of weather helm, and we also found it was not quite stiff enough (taller Carbon mast may have done that). So we went from a L keel to a T and added 500kgs [1100 lbs] plus we also extended the fin aft at the keel line maybe 300mm [approximately 1 ft]. Moved the CLR [center of lateral resistance] aft, helm went back to a appropriate windward helm, boat went 5 degrees higher and about 0.5 knots faster on average, it just did not slow down. So long way about answering your question, but that, a) getting the boat in balance and b) being preemptive so seeing the gust coming, luffing before it hits, getting the traveler down before the gust, and then squeeze everything back on before bearing away which is all simulator learning, all makes a significant difference. My Observations: If I read between the lines, first, I think if Julian had sailed a C Scow, he’d probably redesign it. And second, I believe he’s telling me I can learn to sail a full rig Laser in wind. Not that I’ll be competitive against a big guy, but it should teach me plenty about balance and anticipation. Doug thinks he can teach me those things so we’ll see how the winter goes. Of course, it’s always possible that the first face full of freezing cold water will be the end of my sailing until summer. Now now now, C Scows are still a blast to sail. One design is one design. Right? I probably should have explained. 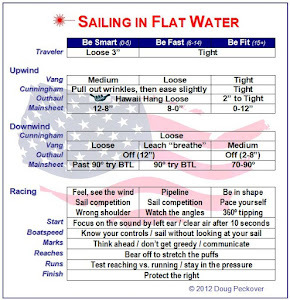 Doug said there was alot of weather helm with the C Scow when he sailed it. It is highly probable that was operator error. The whole concept of sailing heeled seemed backwards to him and he kept thinking it should be flat and neutral helm but he sailed it heeled like everyone else regardless of his instincts. I was just thinking if Julian encountered the same thing and thought the balance issue was a design flaw, he'd just redesign it. Scows heel is the deal. I wonder if the real deal is getting the feel for how much to heel to be ideal? What a surreal ordeal! Doug is getting on a J/22 this weekend. I'm taking bets on whether he falls off the boat. Oh, and he has a broken toe. Broke it just before the CoC and didn't figure it out until this weekend after running a couple of miles and it started to hurt. Jeeesh! Impervious to pain. I (female who - as you - started Laser sailing late and is still working very hard with questionable success to handle a Radial in lots of wind) am amazed by the fact that you stick with the Standard. I wish you a not too cold and wet winter with the mast in the air as often as possible... If you make good progress, please share your experiences with the rest of the world. I love and learn a lot reading your bloggs. Thanks for the encouragement ute! I go back and forth on Radial vs. Standard and if I lived near salt water, I'd probably go with a Radial all the time. Hopefully, I'll learn something this winter that is worth sharing.